Here I am with more Christmas inspiration for you! Today I’m joining a few friends sharing their homes decorated for the holidays as part of the Home for the Holidays Tour. My blush and white palette that I’ve used this year continues in here. And though I considered adding a tree to this room, to be honest, it’s so close to the living room that it seemed like a bit of overkill. We can see the tree right from this space as it’s between the two rooms, and I love the glow it brings to the room when we’re eating in here or playing games. I have to say, I’m completely smitten with the “wreath on the chair” thing! How have I never done this before?! It adds so much charm to the whole space. I’m sure this will be a tradition for me from now on! 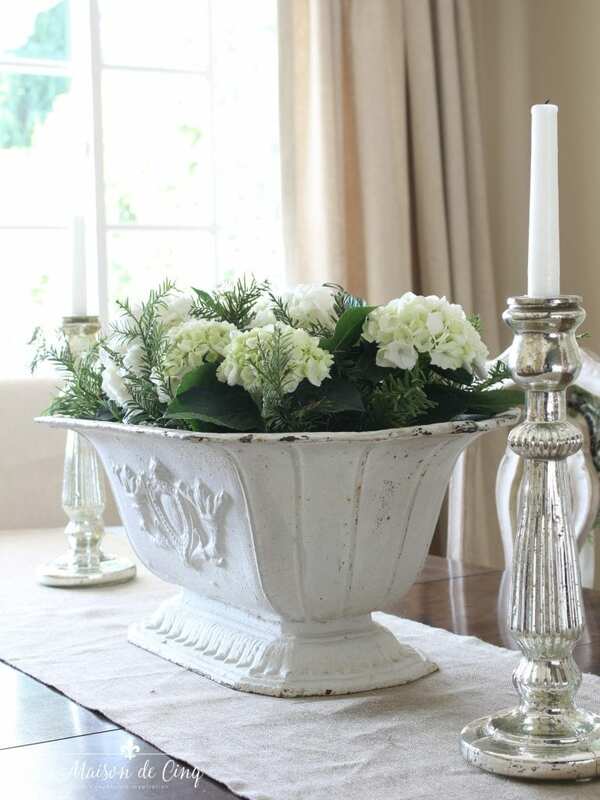 On the dining table, I added some hydrangeas to my favorite French urn. I love using hydrangeas all year as they always look good, and they work with so many other flowers and greens. Mercury glass candlesticks are from Pottery Barn. 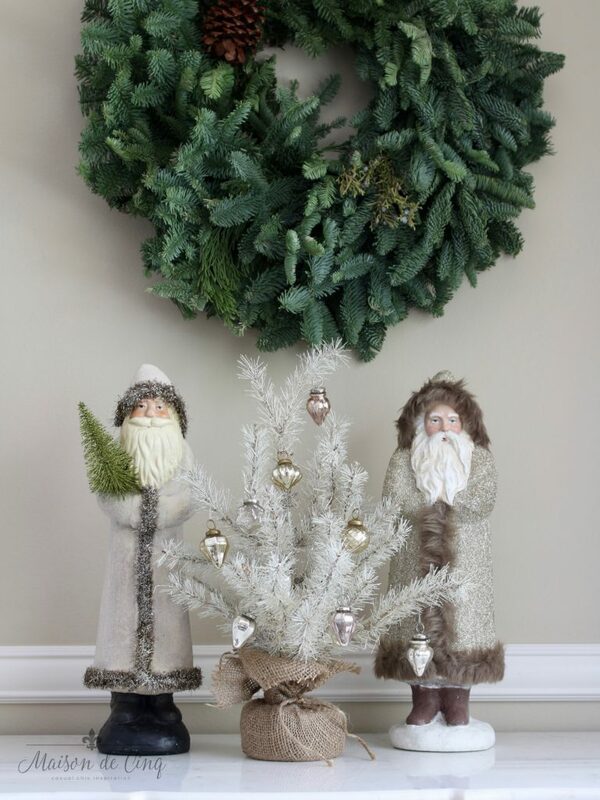 This time, some cedar and pine boughs are added for a seasonal touch. On one of the buffets are my favorite vintage Santas, along with a new little white tree I got this year. I love the size and the color, and with just a few mini mercury glass ornaments, it looks so adorable! On the opposite side of the room, I have a collection of white houses and churches. They are a reproduction version of the traditional Putz houses. I’ve gotten some at Home Goods and TJ Maxx, but my two new ones this year are from Pier One and Pottery Barn. I’m in love with their vintage charm! I’m guessing that most of you are just starting or are about to start decorating, so hopefully you’re getting some wonderful ideas from all the tours! 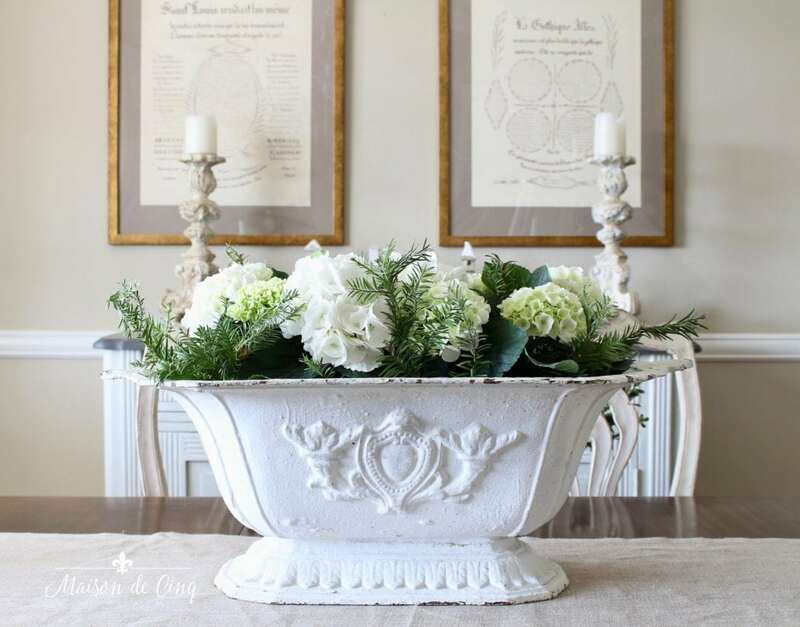 I’ll also be bringing you a Christmas tablescape later this week, as well as my Farmhouse Christmas family room tour. So there’s lots more Christmas inspiration to come! And, there is also a fun giveaway you can enter at the bottom of the post! The tour is sponsored by Bespoke Decor. Read on for an opportunity to enter for a chance to win a $200 gift card to Bespoke. 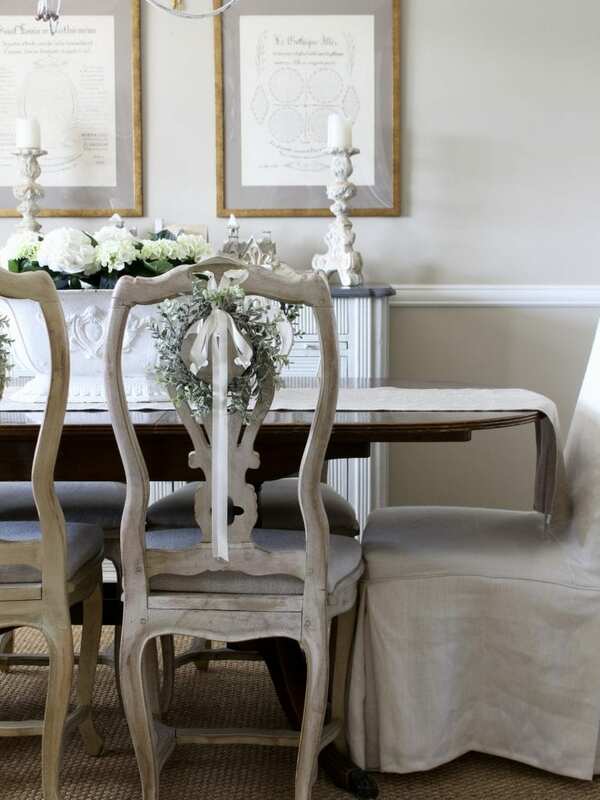 Bespoke Decor is filled with beautiful things for your home & lifestyle from one of a kind vintage to elegant linens. You are bound to find more than a few items you’ll love. Enter to win the chance at a $200 gift certificate by clicking HERE. Gingham – A Spring Trend that Always Charms! As always, so beautiful! 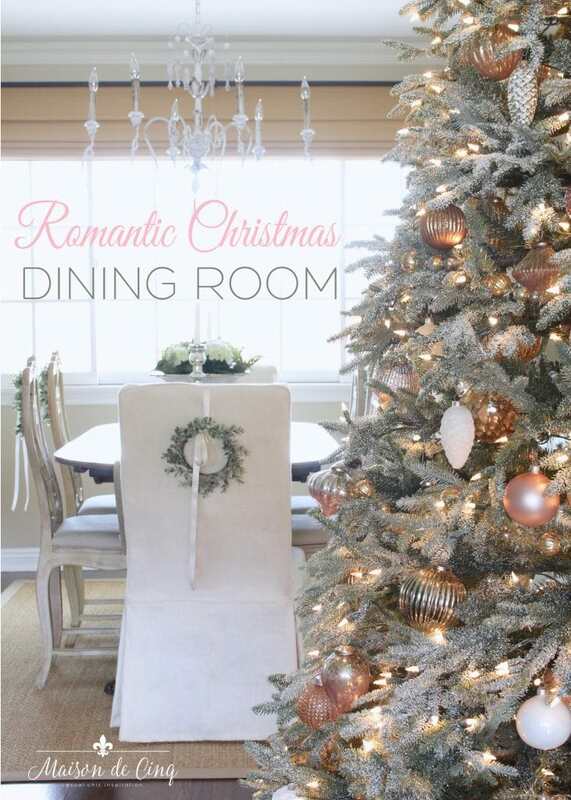 I love the simple elegance of your romantic style holiday dining room. I’m having fun going on the full tour today! Wishing you a wonderful Christmas. Thank you so much Kristy! I still have to stop by several of the tours – I always find them so inspiring! 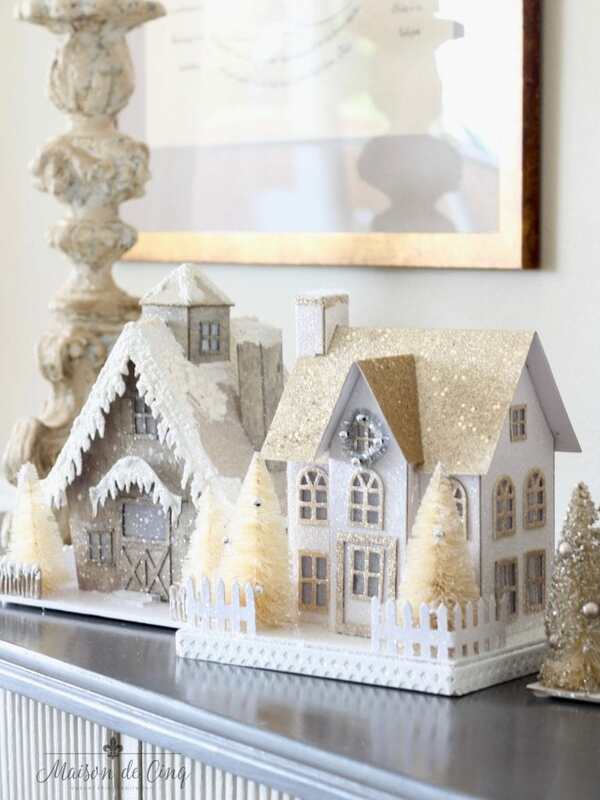 Sheila, your home is gorgeous and I love how you’ve decorated it for Christmas! I love those wreaths on your chairs and your tree. And I can see why that’s your favourite urn! Always fun to be hopping with you my friend! Aww thank you Vanessa – that’s so kind! Love “hopping” with you as always, and can’t wait to sit down and read all of today’s posts! Oh Sheila, Your home is so beautiful. 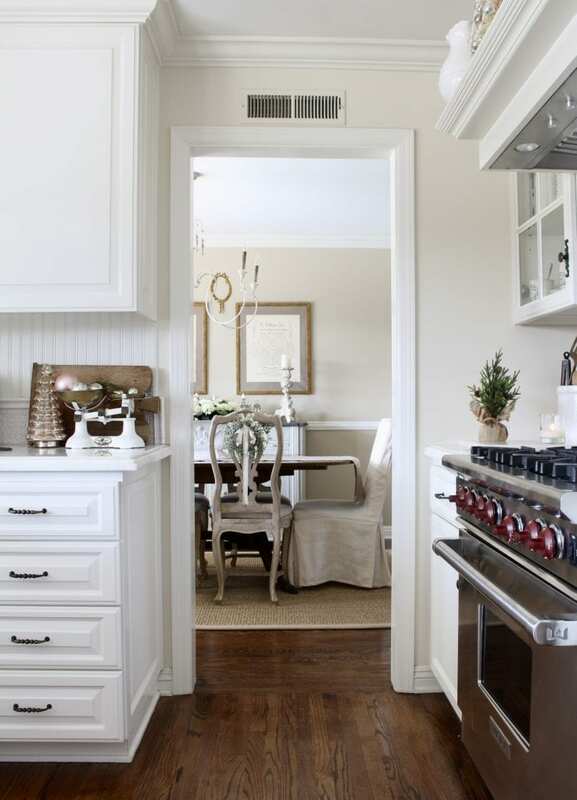 I love your dining room and the wreaths are perfect. I am going to try this but I had one question. 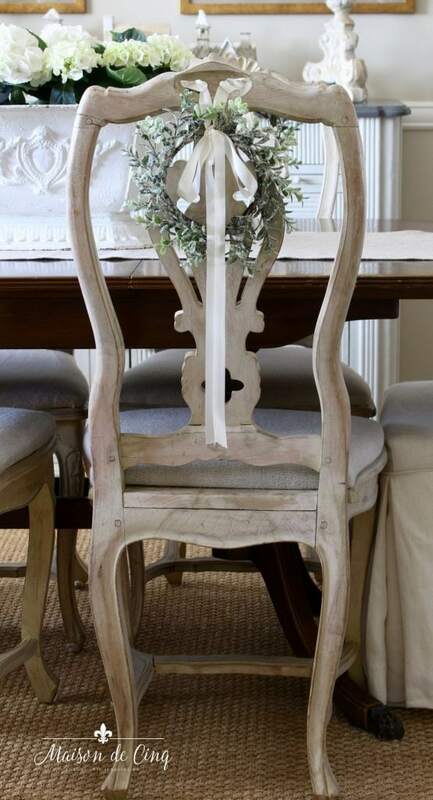 How did you adhere the ribbon to your chairs? Especially the apolostered one? Your home is just gorgeous, thank you for sharing it with us! Hi Rose, and thanks so much for your kind words! The ribbons are pinned (with a straight pin) at the top of the chair where the seam is (there is welting there so I was able to hide a straight pin just fine). And since the wreaths are light, it worked perfectly fine! Hope that helps! And thank you so much for stopping by and for your comment – I truly appreciate it! 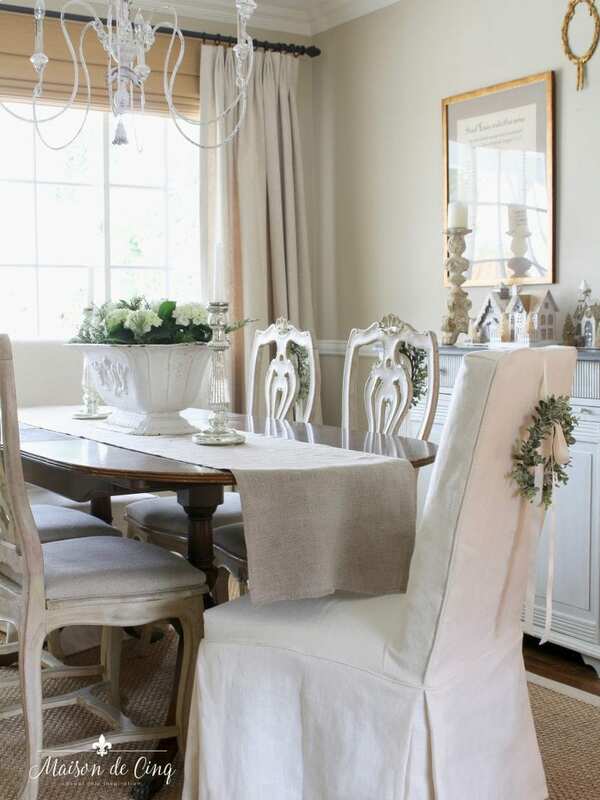 Your entire dining room is perfection but I have to agree with you, the wreaths are the perfect touch and I’m thinking about wreaths for my dining chairs now! Yay – you should! 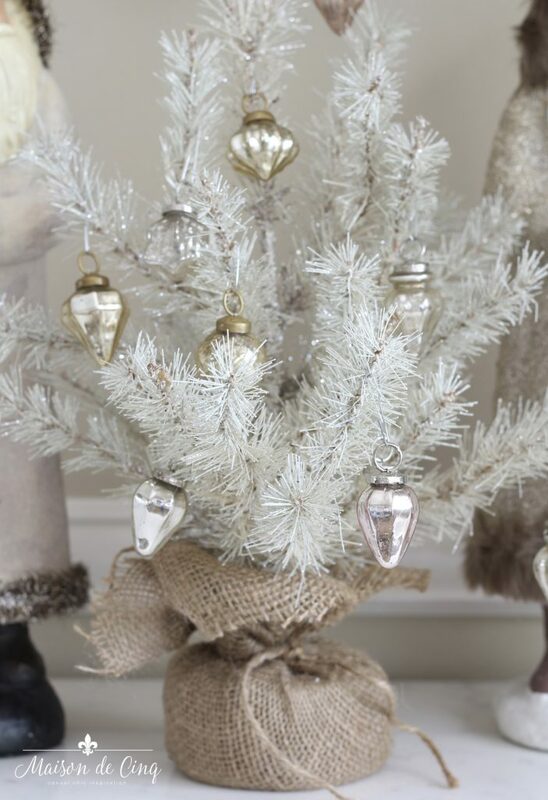 They do really add that seasonal touch, and I’m so glad you think so too! Sheila…your dining room is so beautifully done to greet your family and friends for your most wonderful Christmas festivities. 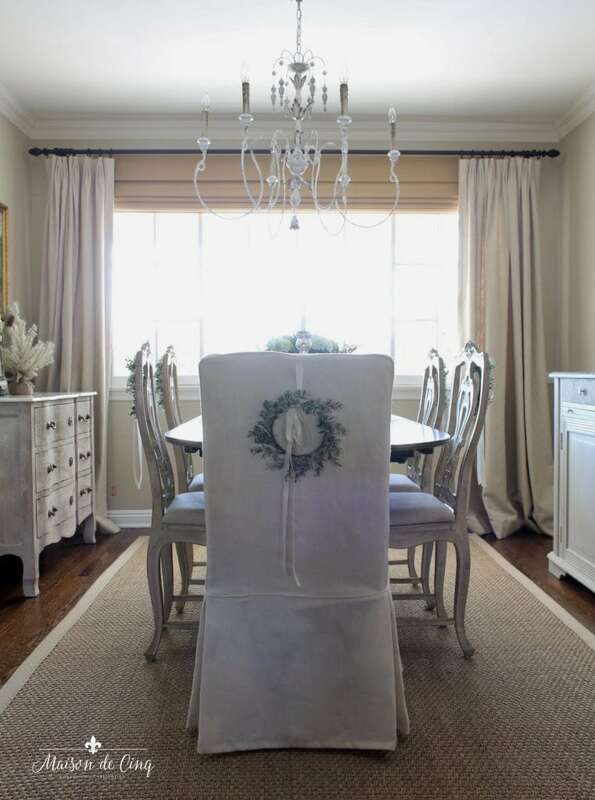 I love the wreaths on the chairs too!….when I placed some on my chairs last year, my hubby gave it the “look” … but then it grew on him and loved it….Your dining room is truly enchanting! Merry Christmas Sheila!!! Thanks so much for your sweet compliment – so appreciate it Shirley! Beautiful room, Sheila and I love your soft colors this year. Thank you Kim! I’m shocked at myself actually, haha! I never thought I liked pink but I’m a convert I guess! Seeing all the homes on this tour fills me with fantastic seasonal decorating ideas… As always, your home is absolutely lovely and I am truly smitten with the little wreaths on the chair backs!! So excited to be part of the tour tomorrow! You’re so kind Cynthia – thank you!! Can’t wait to see your home decorated, too!